Posted on March 16, 2017 at 2:01 pm. “Left foot, Left foot Right foot, Right. Feet in the morning. Feet at night.” Arlington students and staff celebrated the 113th birthday of Dr. Seuss on Read Across America Day, which is Mar. 2. March 2 was a fun day at Randolph filled with reading and language arts activities. The day started with an exciting visit from Clifford the Big Red Dog and Randy, the Randolph Star. Title I teacher Janette Mason organized lots of guest readers who visited children at every grade level in every classroom. Some classes were even lucky enough to have 2 readers. Guests included School Board member Reid Goldstein, representatives from the Ed Center, Kiwanis Club, buddy volunteers, and other community members. In addition, BOSS soldiers were present for their bi-monthly reading with first graders. Kindergartners and third graders got together to buddy read, taking turns reading to each other from favorite books. Finally librarian, Carolyn Fleming coordinated a “Reading is Fundamental” distribution so that every student went home with a new book to call their own. 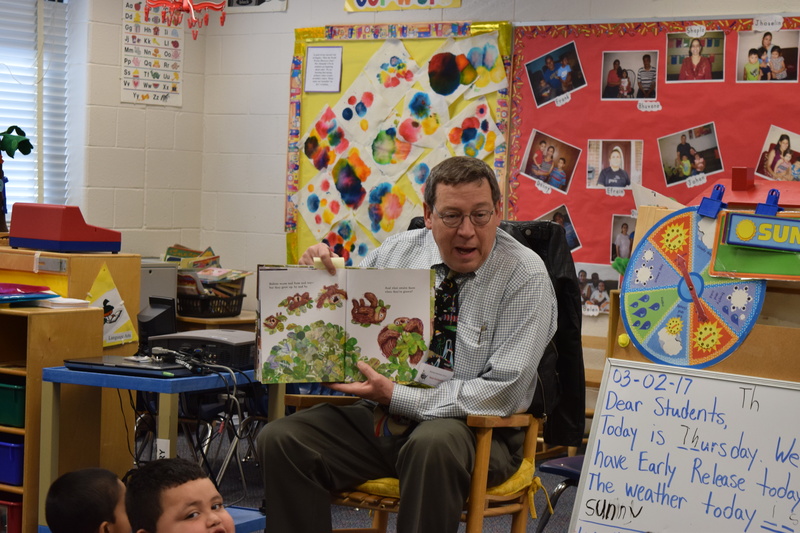 Claremont kicked off their second annual Read-a-thon on Feb. 14 with “Claremont Loves to Read,” a school-wide event where all classrooms celebrated reading parties. Students were super excited to get their friends and family to support their reading with a donation to their school. A large portion of the money raised is used to buy books in Spanish and English for Claremont’s classroom libraries. Principal Jessica Panfil and Assistant Principal Carlos Ramirez challenged students to read a school-wide total of 500,000 minutes during the Read-a-thon. 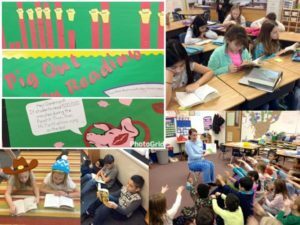 Classrooms were rewarded with popcorn parties for reading 10,000 minutes and the whole school will be rewarded for reading over 600,000 minutes with a special visit from Daisy, the Reading Pig. The Read-a-thon ended on Read Across America Day. Everyone who participated received a prize, and of course, see Principal Panfil gave Daisy a BIG SMOOCH! 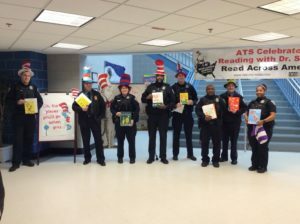 On March 2, eight police officers from the Arlington County Police Department read to students at Arlington Traditional School to celebrate Read Across America Day. The officers donned colorful hats and read a variety of Dr. Seuss books to students at all grade levels. Not only did the officers share their love of reading with students, but they also spoke to students about their jobs and their role in the community. A special thank you goes out to the officers who participated: Police Chief Farr, Deputy Penn, Corporal Haag, Corporal Treakle, Corporal Lennon, Corporal Blow, Officer Keen, and Officer Smithgall. This event was organized by reading teacher Jill Congelio, librarian Monica Hirschberg, and ATS School Resource Officer Corporal Tiffanie Haag. 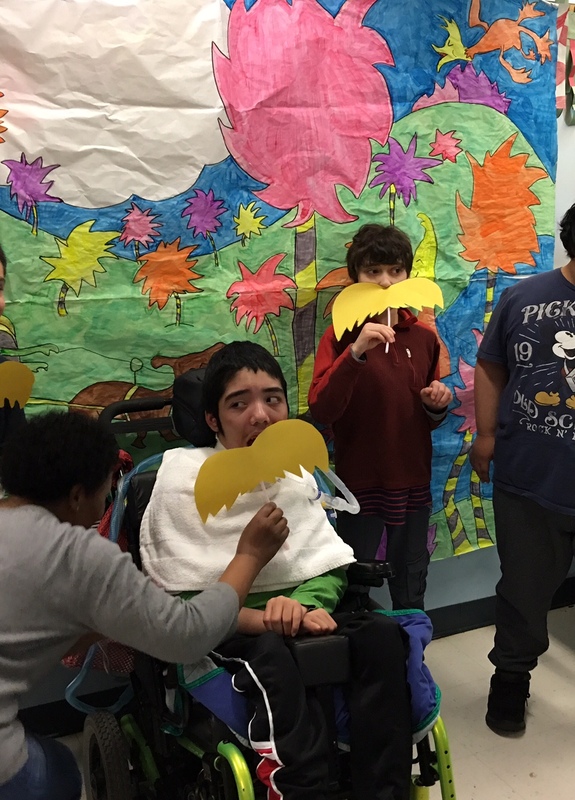 Stratford‘s students and staff celebrated Dr. Seuss day with Green Eggs and Ham, Cat in the Hat Badminton, the Lorax Photo Booth and Hop on Pop. Each station was meticulously set by staff.